Illustration shows procedures for growing ternary molybdenum sulfoselenide on the porous foam; b-c, images showing surface roughness of the nickel diselenide foam grown at 600 degrees C; d-e, morphologies of ternary molybdenum sulfoselenide particles on porous foam, grown at 500 degrees C.
Hydrogen is often considered a fuel for the future, in the form of fuel cells to power electric motors or burned in internal combustion engines. 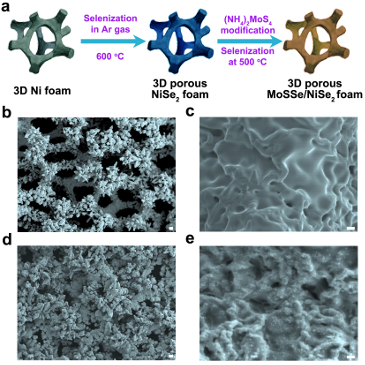 But finding a practical, inexpensive and nontoxic way to produce large amounts of hydrogen gas – especially by splitting water into its component parts, hydrogen and oxygen – has been a challenge. Testing determined that the hybrid catalyst required 69 millivolts from an external energy source to achieve a current density of 10 milliamps per square centimeter, which the researchers said is much better than many previously reported tests. In this case, the current “splits” the water, converting it to hydrogen at the cathode. Achieving the necessary current density with lower voltage improves energy conversion efficiency and reduces preparation costs.